Wild strawberry or forest strawberry is a small fruit, which is very delicious and very useful. This strawberry is just one of 400 known species, but is definitely one of the most beloved. Small, delicious and irresistible is probably the most precise description of this fruit, but folk medicine says that this fruit also is incredibly healthy. Well, now who says that what is healthy is not delicious? These berries can be found in the mountains from May to September. This fruit is rich with many vitamins. Only a hand full of the fruit is sufficient to provide vitamin C for the day. Besides vitamin C, the fruit contains vitamin B, calcium, potassium, magnesium, phosphorus, tannins, flavonoids, vitamin E and more. The presence of manganese in this fruit makes it to be very healthy for the brain, nervous system, blood, bones and the metabolism. Experts say that this fruit should be washed like any other, but not under a strong jet of water, because it loses its nutrients. 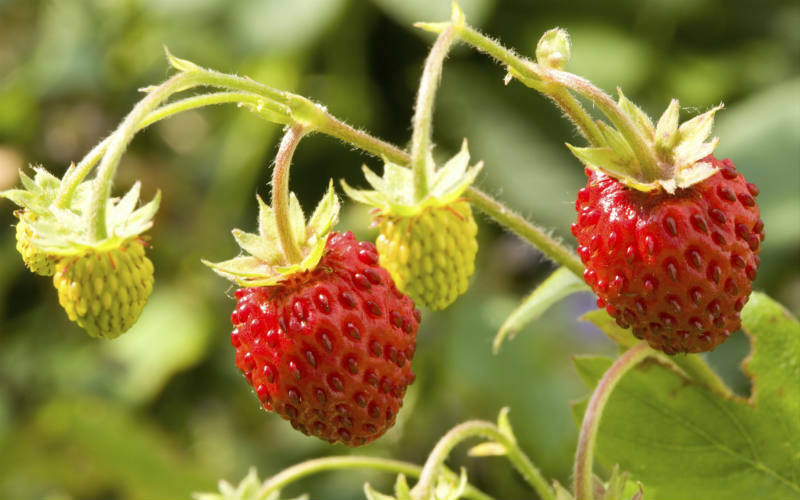 Although the strawberry plant is hardly in use these days as a therapeutic herb, one may still use it to cure stomach disorders like diarrhea and dysentery. While the leaves are boiled in water and used as a gargle to treat aching throat, they also form an important ingredient in some lotions used to treat burns and scrape or scratches on the skin. The fruits or berries of this plant are consumed fresh and possess an excellent flavor akin to strawberry wine. In fact, the berries of wild strawberry are further delicate compared to the common strawberry. The berries of this plant are said to possess antioxidant attributes, while some people claiming that they are also useful in combating cancer. Diabetes, high cholesterol levels and arteriosclerosis can be prevented and alleviated with using wild strawberry. The juice extracts of wild strawberry fruits also possess therapeutic properties and are employed in treating gastritis. As the fruits possess antibacterial properties, there was a time when herbalists used their juice to treat typhoid. Wild strawberry juice is recommended in treating liver disorders such as hepatitis, chronic hepatitis and cirrhosis. It is best if the juice is consumed on an empty stomach, 3 cups a day. The juice stimulates liver activity and encourages the renewal of hepatic cells and tissue. In the past, leaves of the wild strawberry plants were also used for preparing an herbal tea that was taken to cure diarrhea, suppress stomach disorders as well as to augment appetites. In fact, the leaves of this plant are appetizing and enclose vitamin C. It may be mentioned here that the leaves of the alpine strawberries are said to possess natural bleaching attributes. The wild strawberry is a boon for the body, and is great for the heart and blood vessels, works great on blood pressure regulation. Contains very few calories and is an excellent dietary fruit. Has few calories and provides a major contribution in the fight against cellulite. Small but powerful, we have to admit that it would be great to have this fruit more often as a part of our diet.